Several years ago I came across this 1873 engraving of a Chinese spinner. My reaction to the construction of the wheel was amused disbelief--who could possibly believe in a wheel that worked like that? Please. The artist had clearly misinterpreted what s/he had seen. Nevertheless, the engraving is fascinating for its depiction of everyday life in rural China of another time. It looks like a loom behind the spinning wheel. There's a household shrine on the wall behind the well-bundled-up kids, one of whom is plunked in a basket. The dog, I think, is getting scarce before it gets plunked in a basket, too. A couple of years later I came across this photo, and I believed. There are some unique and fascinating aspects of this wheel that are unlike anything I have seen in any other spinning wheels. The drive wheel is not unlike what we see on charkha-type spinning wheels from across Asia. But the spinning head is arranged above the drive wheel, much like a castle wheel, rather than off to the side which is the case with every other spindle wheel I have seen. And take a look at those spindles. In the engraving there are three separate spindles, all driven by the one drive band, and in the photo there are two. (I wish I could get a better look at the mechanism behind the spindle mounting--it looks like it might be some kind of acceleration device.) And look the size of the spindles. They seem to be a foot long or more--far longer than anything we see on other spindle wheels. Both spinners appear to be spinning cotton punis, drafting on all spindles simultaneously. But the most amazing part of this wheel is the means of moving the drive wheel. The spinner has her feet on a double curved beam that looks like it acts as a reciprocating crankshaft. As the spinner's feet move alternately up and down, the crankshaft turns the drive wheel. We are more familiar with cranks with right-angles in the shaft, such as the crank that the footman of your spinning wheel attaches to, which is an extension of the wheel axle, or such as the bicycle pedal crankshaft. I have seen spinning wheels with cranks connected to the axle, whether moved by hand or by treadle connected by a footman. And I have seen wheels and charkhas that are moved by hand, either directly by a hand on the spokes or by way of a knob on one of the spokes or on the disk of the drive wheel. This appears to be a combination of the two. The shaft connects not to the axle of the wheel but to one of the spokes of the wheel near, but not at, the axle. So can it, in fact, be a crankshaft? Perhaps not. I also note that the beam also is part lever, with the pivot point between the spinner's feet. Perhaps it's more lever than crankshaft, with one end of the lever moving in a circle with the drive shaft? If there are any mechanical engineers out there who have a better take on this, I'd sure like to hear from you. Or has anyone ever seen one of these in person? Does anyone have any better images? Please let me know. I have receive a number of thoughtful and helpful comments, both here and privately. As I finished the original entry, I was feeling quite unsure about my analysis of the mechanics of the "treadle". Thus my plea for assistance. Very interesting wheel. 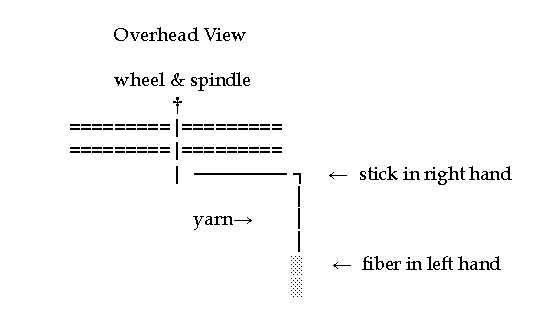 I would guess based on the u-shape of the pivot support and the location of the attachment to the wheel spoke plus the fact that the wheel is situated perpendicular to the spinner instead of in front of the spinner, that the large "treadle" is really acting more like an oar and that the spinner uses both feet to "row" the wheel around by rotating the "treadle". A couple of people asked about drafting and winding on from that position. My best guess was that the spinner would do a lot of swooping up over her head with her left arm. Uh, no. Not quite. In both pictures I see a stick in the spinner's right hand. At the end of the draw, you use the stick as an arm extension to whip the yarns off the spindle tips and divert them to a 90-degree angle to wind on. The left hand doesn't have to move at all. The stick in the right hand grabs the yarn and does it for you. After winding on, when you remove the stick, the yarn spirals to the tip by itself, and you are spinning off the point again. Me, I didn't even see the stick. Pretty cool, huh? I love what the community of fiber people can accomplish. I have been spinning for a couple of years now and have thought, gee why not spin two yarns at once? But i thought it was probably too difficult, or other people would already be doing it. Wrong! Hmm. Must set up great wheel with a second spindle. I did, indeed! In person for the first time, but Ive been talking to them about the project from the outset. Fascinating all the variations on a spinning theme there are, isnt it? Did you see Jonathan Bosworth's Han wheel reproduction? Had to come and check out your images again, after seeing his recreation at Rhinebeck last weekend. 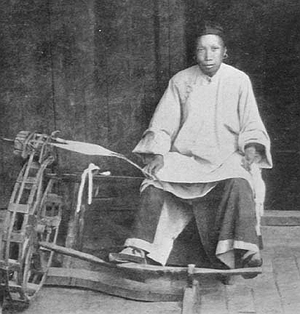 Yes, the foot treadles are like bicycling to push an oar around in circles. HI - I HAVE A SPINNING WHEEL LIKE THE SECOND ONE SHOWN IN THE ABOVE PICTURE. I BOUGHT IT AT A ESTATE AUCTION 7 IT WAS DESCRIBED AS A CHINESE SPINNING WHEEL. I WAS GOING TO POST A PHOTO, BUT NOT SURE HOW? This is a cool wheel! 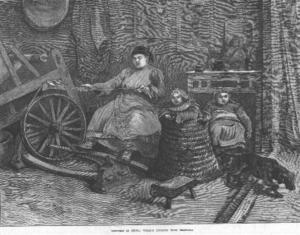 I've seen some silk-throwing wheels that had LOTS of spindles - of course, they're not dealing with drafting. I'm fascinated with the stick! It's amazing how well things work, once you figure out the right tools! Totally fascinating. Wouldn't it be great to take a trip over there and study some of their fiber arts traditions? What a shame I wasn't a spinner when I was in Hong Kong. The links I listed above are of Chinese spinning wheels I found when I searched Google images with the search phrase "Chinese spinning wheels"
The first image is described as Antique Chinese Silk Spinning Wheel. The second is labeled as just a Chinese spinning wheel. I'm a doctor, not an engineer, so I can't offer any insight. But it's amazing how many variations actually can work. Yes, I like the concept of a rowing machine with regards to the treadle. Since it is connected quite closely to the hub, there won't be a lot of movement, and the operator would sort of walk through it. There would be the slightest circular action with the feet. I can see this working quite well. The most interesting thing are the spindles! While, technically, it should be possible to spin 2 or even 3 yarns at once, but I don't think I could do it. The movements with the hands should all be the same, so you might as well do 2 or 3 at the same time and get more done. This all comes down again to proper preparation of your punis! When you have that, the spinning sort of takes care of itself -- you just have to go through the motions. ..maybe it would help in ascertaining the origin of this style of wheel? Very interesting wheel, thanks for posting about it! oh yeah, I like the kid in the basket too. I am curious how the spinner manages to spin 3 or even 2 different punis at the same time. At first looking at the photograph, I was guessing they were both drafting off the same puni, but in the engraving she is clearly holding more than one puni. This sounds like it needs an experiment! Although, if you were spinning properly it shouldn't take much effort in the fiber holding hand and the other hand would be the "regulator" keeping track that all the threads are flowing nicely. The amazing thing about the engraving is just how she is holding the fibers. Wouldn't the cotton tangle in the hand? It looks like it makes a rowing motion with her foot to me. Makes one just itch to try this wheel, doesn't it? I was struck by the similarity to mice in a cage and the structure of the wheel on her left. That must be her eight-hour-a-day job - no joy there. She looks resigned. I love to spin but I wouldn't want to be her. It looks rather like the modern rowing machine exercise equipment. AA and SG don't have the bandwidth to view your blog -- could you print a copy of this post, mail it to them, and see what they say? Fascinating! It's very intriguing and I've certainly never seen anything like it. It would sure take up a lot of room! A very early interpretation of a double-treadle wheel, eh?